SOCAR - State Oil Company of Azerbaijan Republic is one of the largest oil companies in the world in oil and gas recovery sphere. Socar’s total annual production amounts to over 20 million tons of oil, oil products and crude oil obtained as a result of refining are exported to different countries of the world. Newest technologies and technical reequipment introduced over the last years have significantly improved quality and increased the amount of the production. In Georgia Socar has founded a subsidiary Energy Georgia Ltd. the daughter company of which is Socar Georgia Petroleum Ltd.
1. The largest taxpayer in the oil industry to the budget of Georgia in 2007. 3. Company having exhibited the highest social responsibility record. 1. The Best in­vest­ment project of year. 2. The Largest budgetary payment. 3. The Scale social program. 1. The largest taxpayer in the oil industry to the budget of Georgia in 2008. Early in 2009 the company provided all employees with health insurance. In 2008 trade unions were formed that joined Georgia oil, gas and coal industry trade union. The trade unions with company management active participation organize cultural and sport activities for the employees. Thus company management arranged New Year corporate event, and also held an event dedicated to the international Women’s Day. SOCAR Georgia Petro­leum plans to increase oil products turnover. For this purpose, con­struction of petroleum storage depots using modern technologies will begin in the nea­rest future. Longterm business and partner­ship relations between "SOCAR Georgia Pe­tro­le­um" LTD and Sta­te Oil Company of Azerbaijan Republic ensure permanent and uninterrupted import of fuel from Azerbaijan to Georgia. 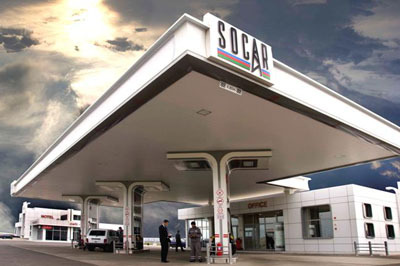 SOCAR Georgia Petroleum also plans to expand its chain of petrol stations. Currently "SOCAR Georgia Petroleum" owns 23 petrol stations in Tbilisi, Gardabani, Bolnisi, Rustavi, Poti, Gurdjaani. Seven more filling stations will be opened and launched into operation in the nearest future. As a whole it is planned to open 40 petrol stations in Georgia to provide the consumers with high quality service. For operative monitoring company hotline provides twenty-four-hour service, all received claims and remarks are subject to urgent estimation and reaction. Persons interested in employment at SOCAR Georgia Petroleum have the opportunity to take a course of training at company training center. Currently more than 300 people have taken training courses for managers, shift supervisor and the cashier-operator. At present the company has 300 employees; their number will increase to 400. The company has individual and corporate clients, soon will be launched modern integrated systems of coupons and cards. For this purpose a service center in Vazha Pshavela ave., Tbilisi has been opened. SOCAR Georgia Petroleum actively competes with other companies operating in oil market. SOCAR Georgia Petroleum share at Georgian petroleum market makes 57.7% and at diesel market – 57.9%. Even in difficult situation on World Market SOCAR Georgia Petroleum did its best to meet the consumers’ requirements and make its production avai­lab­le for every customer. SOCAR Georgia Pet­ro­leum always keeps up with events in Geo­r­gia and takes active part in all measures aimed on welfare of the country and its population. Charity and work for the benefit of Georgia are the trademarks of the company.